After 5 1/2 years and 70 columns written exclusively for The Chronicle, this is my last. As I move on, I do so with much hope for a healthier and more equitable food system. My optimism comes from taking the long view of progress in agriculture, food, nutrition and public health. When I look back on what’s happened since, say, 1980, I see enormous improvement in the foods available in supermarkets and in schools, the availability of organic and locally grown food, and public interest in everything about food, from taste to politics. At this time of year, it’s customary to highlight the 10 most notable achievements of the past 12 months. But let me point out one conspicuous absence from this list – the creation of a stronger and more compassionate safety net for the poor and unemployed. Working toward this goal needs to be high on the food advocacy agenda for 2014. School nutrition standards: The new rules are the result of the most significant achievement of Michelle Obama‘s Let’s Move! campaign – the Healthy, Hunger-Free Act of 2010. This act required schools to provide not only healthier meals, but also snacks. Early reports find most schools to be doing a good job of putting the new rules into effect. Yes, the rules do not go nearly far enough (they are too generous in sugar, for example), but they are a step in the right direction and lay the groundwork for even better standards. Food safety rules: The Food and Drug Administration finally started issuing regulations for the Food Safety Modernization Act of 2010. Once final, these rules will go a long way toward requiring food producers to take measures to ensure safety, and giving the FDA the authority to make sure they do. Yes, its details still need tweaking, but FSMA is a milestone on the road to a safer food supply. The next steps will be to bring the U.S. Department of Agriculture’s authority in line with the FDA’s, and to develop a single food safety agency that combines the functions of both. FDA’s guidance on antibiotic resistance: The FDA has called on drug companies to voluntarily agree to stop using medically important antibiotics to promote growth in farm animals and to require a veterinarian’s prescription when using these drugs to treat, prevent or control animal disease. Yes, this is voluntary and drug companies have three years to comply. But the FDA has taken the first step toward banning antibiotics for anything but therapeutic purposes, an impressive achievement given current political realities. Let’s Move!’s food marketing initiative: Marketing is the elephant in the room of childhood obesity. It overwhelmingly influences kids to prefer, demand and consume junk foods and sodas. Mrs. Obama’s Let’s Move! campaign has no authority to regulate marketing to kids. By keeping a focus on this issue, she gives advocates plenty of room to hold food companies publicly accountable for their marketing practices. Soda and junk food taxes in Mexico: Despite intense and well-organized opposition by its soda, sugar and small-business industries, the Mexican government passed a 1-peso-per-liter tax on soft drinks and an 8 percent tax on junk foods. These measures were meant to counter the country’s 70 percent of overweight people and, no coincidence, record-breaking soda consumption. The initiative succeeded as a result of strong advocacy support and also because the revenues were committed to social purposes, among them providing clean drinking water in schools. Other countries are likely to be inspired to enact similar measures. GMO labeling initiatives: Connecticut passed a GMO labeling law in 2013, but election initiatives in California and Washington failed. Even though the food and biotechnology industries poured tens of millions of dollars into defeating labeling measures, the margins of defeat were small. My crystal ball says that some such measures will eventually pass. The food biotechnology industry must think so too; some of its groups are calling for voluntary GMO labeling. Fast-food workers’ wage demands: People who work full time should be able to support their families and not have to be on public assistance. If you work 40 hours at the federal minimum wage of $7.25 per hour, you will earn less than $300, and that’s before taxes. USDA‘s agricultural coexistence initiatives: By agricultural coexistence, the USDA means peaceful relations between quite different farming systems – industrial and GMO versus organic and sustainable. Peaceful coexistence would be a lot easier if GMO pollen didn’t drift onto organic crops, if Congress supported sustainable agriculture in proportion to its size, and if the ag-biotech industry didn’t dismiss cooperation out of hand. The New York City mayoral candidates forum and coalition building: About 85 food and nutrition advocacy groups put their differences aside to jointly question mayoral candidates on their views about food problems facing city residents. Seven candidates showed up to answer questions, a clear sign that coalitions are strong enough to demand attention. A personal perspective: The past year brought many new food studies programs into universities. When we created food studies programs at New York University in 1996, only one other such program existed. Today, universities throughout the country are training young people to advocate for food systems healthier for the planet and for people, rich and poor. The message of both books – the first in text and the second in cartoons – is the same: Vote with your fork for a more delicious and sustainable food system. Even better, vote with your vote! Engage in food politics to make our food system more conducive to health and social justice. The food movement is making much progress, but much more remains to be done. I’ve had a great run at The Chronicle, for which I deeply thank readers and editors. I will continue to write about food matters on my blog, at www.foodpolitics.com. Please join me there. Why no San Francisco Chronicle column today? A repeat (sigh). I’m repeating this post from last week because, evidently, I’m confused about dates. Today is the first Sunday in December; last Sunday was not. Here’s what I said last week. It’s still true. It’s the first Sunday in December and normally I would be posting my San Francisco Chronicle Food Matters column. But I am leaving the Chronicle—after five and a half years and nearly 70 columns. I will write one more for the end of the year, but that will be the last. My timing turned out to be prescient. My column appeared in the Chronicle’s free-standing, prize-winning food section. The Chronicle is now ending that separate section. I have no information about why this is happening other than what’s been speculated and what the paper’s editor says. I started writing the column in the spring of 2008 at the invitation of Michael Bauer. I thought it would be a splendid opportunity—a public platform for my ideas about food and nutrition—and the chance to work with writers whose work I respected. But I also knew that the paper was having financial difficulties and did not expect it to survive for much longer. I agreed to take on the column under the assumption that the paper would not last more than a year or so. At first I wrote a column every three weeks. When that proved too much—I do have a full-time job at NYU, after all—I asked to have the schedule reduced to once a month. Even that proved difficult. My editor at the Chronicle has always been the terrific Miriam Morgan, who convincingly discouraged my occasional attempts to give up the column. But now I’m working on a demanding book manuscript and the column is too much of an interruption. I will miss having the column, but I won’t miss the deadlines. My column’s time has come. But when Miriam Morgan told me that the paper would be making some changes in the food section, I had no idea that this meant the end of the food section as well. But all may not be lost. Want to help save the Chronicle food section? Click here. Q: I hear that the Mexican government wants to increase taxes on sodas as a way to fight diabetes. The soda industry persuaded voters to defeat soda taxes in Richmond and El Monte last year. Won’t it do the same in Mexico? A: It might. I’m just back from a lecture trip to Mexico City where I heard plenty about the proposed soda tax and the industry’s response to it. Last month, the Mexican government proposed an additional soda tax of one peso (about 8 cents) per liter. The idea is to raise $1.5 million per year while discouraging soda consumption, thereby helping to reduce the country’s high prevalence of obesity and Type 2 diabetes. Mexicans drink lots of soda. By some estimates, average per capita consumption is 50 gallons a year, the highest in the world. It’s no coincidence that more than 70 percent of Mexicans are overweight or obese, and around 15 percent have Type 2 diabetes, a prevalence that terrifies health officials. This type of diabetes, if undiagnosed and untreated, can lead to blindness or foot amputations. Mexico is a classic example of a country in “nutrition transition.” As the economy improves, people increasingly buy high-calorie ready-made foods, put on weight, and raise their risk for diabetes. Meanwhile, the poorer segments of the population continue to experience high levels of stunting, iron-deficiency anemia and vitamin A deficiency. This makes obesity a relatively new problem in Mexico, one widely understood to result from the introduction of processed foods – especially sodas – into the Mexican food market. I could easily see how deeply sodas are embedded in Mexico’s food culture. Sodas were advertised and available everywhere. And they come in enormous three-liter bottles that cost less than the price of bottled water – only 17 pesos ($1.35) each. Clean water is not always available, making sodas the easy choice. Sodas are cheap because Mexico grows its own sugarcane and sells it at market prices. We, however, artificially support the higher price of U.S. sugar through tariffs and quotas. That’s why our sodas are made with high fructose corn syrup. We subsidize corn production so corn syprup costs less than sugar. Some people think cane sugar tastes better than high fructose corn syrup, although controlled taste tests don’t always back this up. It’s ironic that U.S. supermarkets now carry, at highly inflated prices, Mexican Coca-Cola sweetened with cane sugar. Industry efforts to defeat the Mexican soda tax have been ferocious, just as they were in Richmond and El Monte last year. Producers argue that if the tax really does decrease consumption, it will cause hundreds of thousands of jobs to be lost. An ad from the sugarcane industry also threatened job losses – “The tax will generate unemployment and discourage productivity and investment” – and noted that workers and the poor will bear most of its burden. As with any such initiative, the big questions are whether the tax is likely to reduce soda consumption, obesity and diabetes, and whether the revenue will be used for widely beneficial public health purposes. Mexico’s Congress will have to address these questions when it votes on the tax in the weeks ahead. In the meantime, a coalition of consumer and health groups, in part funded by Bloomberg Philanthropies, has been putting posters in subway stations that illustrate the amounts of sugar in soft drinks. The groups are actively advocating for the soda tax and for using its funds to provide free potable water in schools – something that does not now exist. But TV stations have refused to carry their ads for fear of losing soda advertisers. Like their U.S. colleagues, Mexican public health authorities are searching for effective ways to reverse obesity trends. Sugary drinks are an easy target. Taxing them might happen despite industry opposition – especially if the funds are earmarked for clean water. 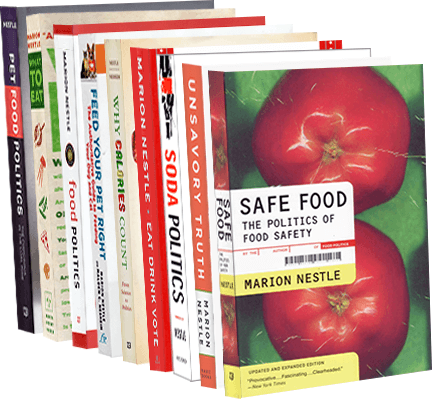 Editor’s notes: Marion Nestle will discuss her new book, “Eat, Drink, Vote: An Illustrated Guide to Food Politics,” with Narsai David at the Commonwealth Club on Oct. 15 at 6 p.m., and at Book Passage in Corte Madera on Oct. 19 at 11 a.m.
She is also receiving the James Beard Foundation Leadership Award for her writing about how science and public policy influence what we eat. The award ceremonies are Oct. 21 at the Hearst Tower in New York. I used my August (monthly, first Sunday) column for the San Francisco Chronicle to reflect on the meaning of the Mayor’s Food Forum last month. Q: I hear that you moderated a food forum for candidates for mayor of New York City and got them to say what they thought about hunger, nutrition and local agriculture. Did any of them say anything worth telling? A: The forum was indeed amazing. But I’d go further. I’d call it historic – a turning point in the food movement. This had to be the first time that food advocacy organizations – an astonishing 88 of them – joined forces to induce candidates for city office to agree to respond to questions about issues of concern to every one of those groups. Six candidates turned up. What they said hardly mattered (and at this point, the less said about the individual candidates, the better). What does matter is that they thought this audience important enough to come and state their positions on how food production and consumption affect public health, and how political leaders can use their authority to improve the food system. Food issues have become prominent enough to make politicians and would-be politicians take notice. The sold-out audience of nearly 1,000 filled the auditorium at the New School as well as two overflow rooms. Others watched the forum streamed live online. (http://new.livestream.com/TheNewSchool/nycfoodforum). When I was invited to moderate, I could hardly believe what the organizers had accomplished. Twelve groups, each working separately for improvements in food assistance, food access, working conditions, local farming, food systems or health had formed a coalition to plan the forum and make it happen. These groups met for a more than a year to identify the specific issues they most wanted candidates to think about. Judging from the length of the questions I was given, this cannot have been easy. The organizers must have been exceptionally patient – and persistent – to get 12 advocacy groups to agree on the key issues. They also did a great deal of community organizing. They not only recruited 76 other food advocacy groups to support the forum, but also encouraged development of an additional forum for young people in low-income communities to get involved in the food issues most relevant to their lives. Some of these kids were invited to ask questions of the candidates. One, from a Brooklyn teenager: “Where do you shop for food?” This may sound like a naive question, but it elicited a surprisingly thoughtful response that touched on sensitive issues of income and class. The grown-up questions concerned issues vital to the host groups: How would the new mayor address hunger and food insecurity, inadequate access to healthy food, the low wages and inhumane treatment of restaurant and fast-food workers, the poor quality of school food, and the high rates of diet-related chronic disease among city residents. Such problems are hardly unique to New York. Even the more city-centered questions – how to use the city’s purchasing power to support regional agriculture and the food economy, and to promote city land for urban farming – have plenty of relevance for other urban areas, including Bay Area cities. The candidates made it clear that they had thought about the issues, and had come prepared to address them. Here’s my inescapable conclusion: The food movement is strong enough to make candidates for office stand up, listen and take food issues seriously. Last fall, writing about California’s Proposition 37 that sought to label genetically modified foods, Michael Pollan issued a challenge to food advocates. The food movement, he said, needs to do more than work for agricultural reform and an increased market share for healthier food. Advocacy groups need to get together to create a real political movement – an organized force strong enough to propel food concerns onto the national agenda and force politicians to take action to improve food systems. The forum was a first step in that direction. It proved that food coalitions can have political power. I can’t think of a better time for food advocacy groups to join forces and work collectively toward common food system goals. Q: I read that the new farm bill is going to establish a checkoff program for organics. What’s that? Is this good for organics? A: As with everything in food politics, the answer depends on who you are. If you are a big producer of organic foods, it’s good news. If you are small, it may cost you more than it’s worth. And if all you want is to buy organic foods at a price you can afford, it could go either way. Let’s start with the farm bill, which still has many hurdles to jump before it gets passed. The bill ties agricultural policy to food stamps (which take up 80 percent of the budget), favors large industrial farms over small, and only occasionally tosses in a token program to promote public health or environmental protection. The way this works is that if the amendments survive, the bill passes and organic growers agree on the program – all iffy at the moment – the Department of Agriculture will require every producer and handler of certified organic foods to pay a fee per unit sale (the checkoff). The fees go into a common fund to be used for research and marketing of organic foods in general. The USDA currently administers 19 checkoff programs. The best known are beef (“it’s what’s for dinner”), milk (“got milk?”) and eggs (“the incredible edible”). Others cover foods such as blueberries, Hass avocados, mangos, peanuts, popcorn and watermelon. The Organic Trade Association, which represents hundreds of organic producers but is dominated by the big ones, has lobbied for this program since 2010. The association is concerned that consumers cannot currently tell the difference between “natural,” a term that is unregulated, and “certified organic,” which is highly regulated, requires inspection and is more expensive to produce. That many producers of conventional foods and their friends in Congress do not like organics is an understatement. They resent that consumers are willing to pay premium prices for organics. They consider organics to be a slap in the face – a personal assault on conventional agricultural practices. They cite many reasons why the organic checkoff should not be allowed. For one thing, it is distinctly different from all other commodity checkoff programs – “organic” is a production process, not a food. Checkoffs are about marketing. They are not about health, sustainability, human welfare or any other value cherished by today’s food movement. Much as I favor organic over conventional production methods, I’m hoping organic producers will think carefully before approving a checkoff.